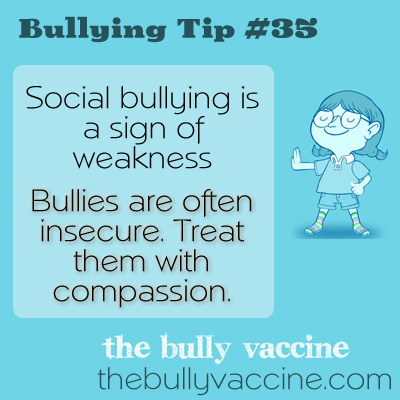 Bullying Tip #35: Why bullies bully and why their insecurity matters. Social bullying is a sign of weakness. Bullies often insecure. Treat them with compassion. One of the main reasons bullies bully is because they are insecure and they don’t know how to deal with their nervousness well. Understanding why bullies bully will help you respond to them without fear and with compassion.